Lock on My Heart – Jenny and Jonathan Got Married! So I didn’t end up seeing everybody queuing up outside of the convention center to see Bernie Sanders on Thursday, after all. Jonathan and I went to Phipps Conservatory on Thursday after work. (It was Phipps’ Members Night!) I took a bus from downtown Pittsburgh to Oakland to meet him. Whenever we do this, I change where I park my car in the morning. (Since on those days, I pick up my car several hours later than normal.) This, in turn, changes the bus that I take downtown in the morning. So on Thursday morning, I commuted on a bus that does not pass the convention center. However, a co-worker’s high-school daughter cut class to attend the Sanders rally, so I heard about how she waited outside the entrance for hours and then just narrowly made the cutoff for admittance. Others weren’t as lucky. So, anyway, after work I took a bus to Oakland and disembarked across from Pitt’s student union. 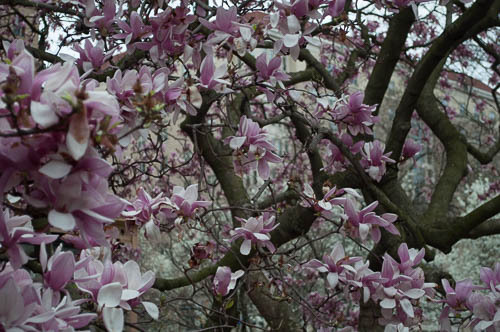 I stood in the rain and took the above photo of the magnolia tree right there. I could tell that a bunch of the kids sitting in front of a window in the student union laughed at me. Then I ran up onto the student union porch to re-pack my camera bag. Also to listen in on a phone conversation from a young woman sitting on the porch. The woman was really inspired by Bernie Sanders and today’s rally gave her much to think about. Her unknown friend shouldn’t feel too bad about missing the rally. Sanders will probably come back to Pittsburgh for the general election. Now, college students who come to downtown Pittsburgh to see a political candidate, any candidate, from any political party, irritate me. Why? Earlier this week I thought it was because they make downtown traffic worse. Get out of my way! I’m trying to earn a paycheck! Today I realized that they bring out my inner crank for a different reason. They have the cojones to ask for a change in the status quo after I already learned to live under it. I sat down under the big tent in Schenley Plaza to wait for Jonathan. 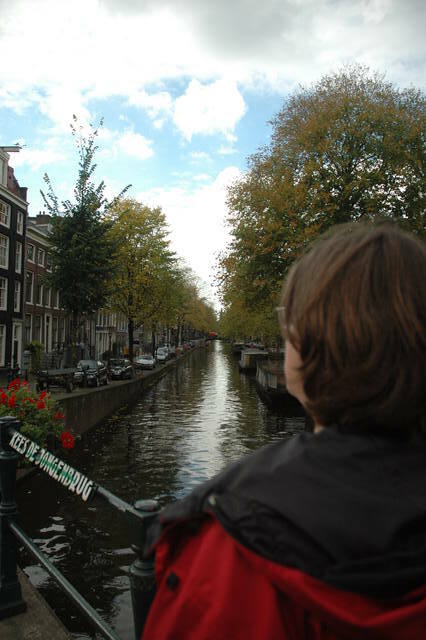 I watched the youth, with their backpacks and their dreams. During the first years of our marriage, Jonathan worked on the campus of Carnegie Mellon (CMU) and even back then I worked downtown. At the end of most workdays, I bused from downtown to Oakland, then walked across the campus of CMU to meet Jonathan. Then we carpooled home together. I envied the Carnegie Mellon folks because they went to a fancier school than my own alma mater. More prestigious. This makes me a brat. However, when I was a teenager in Somerset County, a bunch of the moms from my church talked about this “rich kid school.” About how it wasn’t for people like us. One time when I was at CMU waiting for Jonathan, a young woman handed me her camera and asked me to take her picture in front of CMU’s library. (I forget the library’s name.) She was a CMU alum, back to visit. She had a photo of herself in front of the library from when she was a freshman. She wanted the same photo, five years later. Jonathan parked in front of Schenley Plaza and we walked across the Schenley Bridge to Phipps. (Parking gets dicey at Phipps for special events.) I stopped and read the locks, like I do every time that I stand on this bridge. Locks bearing the names of lovers now cover many bridges in Pittsburgh and many other cities. However, the locks on the Schenley tell me a story. See, Schenley Bridge spans Panther Hollow. Panther Hollow separates Pitt from Carnegie Mellon. 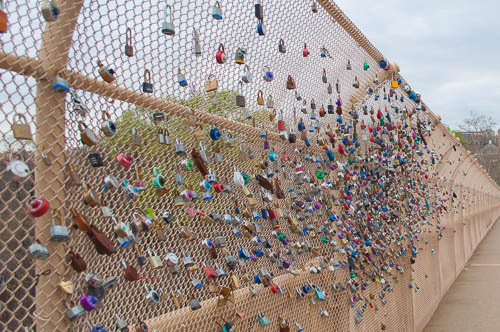 I bet that college kids put most of the locks on this bridge. I slightly envy couples who meet and fall in love in college. Those people had each other for the beginning. Perhaps on a balmy winter day, they wrote their names on a lock, closed “their” lock on Schenley Bridge, and threw the key into Panther Hollow. Then they went back to class, then graduated, then got married. They rented a loft in a gentrifying city. And their entire story began in Introduction to Philosophy or something. I told this all to Jonathan. And then we joked that this is what really happened: The bride-to-be probably joined the Pittsburgh board on The Knot. All of the other brides (called Knotties) on the Pittsburgh board talked about ordering an engraved LOCK from Things Remembered. This bride also needed a LOCK from Things Remembered to commemorate The Day. She added this to her wedding “to-do” checklist. (The “to-do” checklist is the Bible for Knotties.) This bride made the groom go to Things Remembered with her the same day that they picked out the wedding bands. 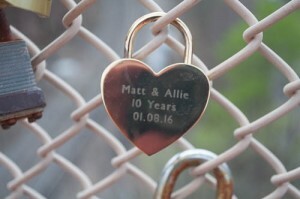 She put her groom in charge of remembering to bring their LOCK to the ceremony. He forgot to do this. After the Newly Married Couple took their deathless vows and climbed into their limo, she asked him for the LOCK. He didn’t have it. Married for 30 minutes, and the groom was already in trouble with his wife. 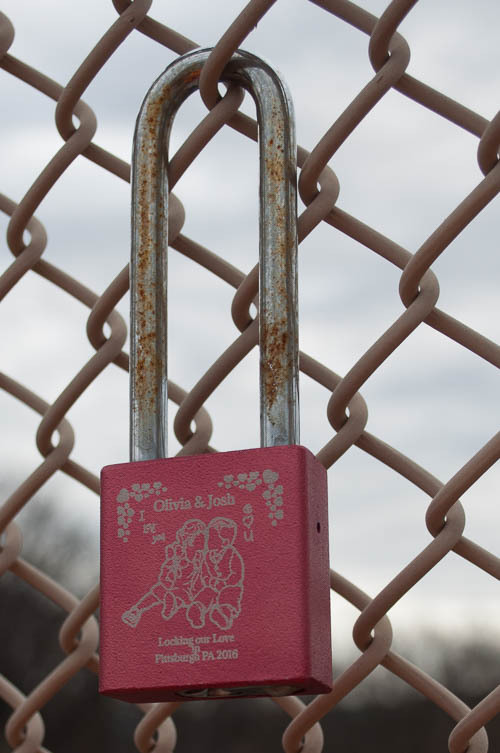 After they came back from their honeymoon, they FINALLY placed their LOCK onto the Schenley Bridge. Then they rented a loft in a trendy city.